It was business as usual at the Alaska Regional Hospital in Anchorage on Monday. 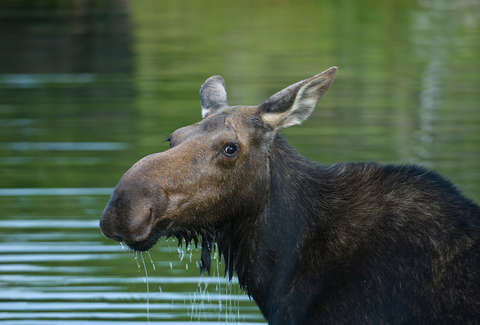 Doctors were seeing patients, staffers were chatting, and then all of a sudden the day took an exciting turn when an unexpected guest ambled through the doors into the lobby: a big ol' moose. Around noon, the Alaska Regional Hospital was greeted by a massive cow moose who found her way into the lobby and beelined straight to its decorative tropical greenery. Seeing the majestic creatures up-close is fairly common in America's northernmost state, but discovering one lounging in the same place people go for annual checkups naturally caused quite the stir. The four-legged female seemed pretty unfazed, though, and calmly explored and taste-tested the variety of fronds on display. Fortunately, a handful of onlookers hurried out to the lobby once word spread and managed to capture photos and video of the scene. On such clip shared by a hospital employee has already racked up over 1.3 million views so far. So what compelled the gentle beast to come inside? No one's totally certain, but some speculate it was to grab a quick green snack, or possibly take a break from the sub-zero outdoor temperatures. “We think she was just wandering along the sidewalk and saw the greenery,” hospital spokeswoman Kjerstin Lastufka told the Anchorage Daily News. For what it's worth, she didn't have to try very hard to get in, because the door she walked through was actually stuck open due to the cold weather, according to the ADD. She stayed for about 10 minutes and walked back outside after a small crowd had gathered to get a look at her. Authorities then quickly locked the door. No word yet on whether or not she pals around with that other Alaska moose with a penchant for ding-dong ditching.